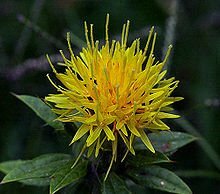 Organic Safflower Oil is a gentle, light carrier oil. This is the perfect oil for babies' (6 months and up) sensitive skin. Safflower oil is a great massage oil, and, in fact, is one of our favorites. It's nearly clear, has a great 'glide' that massage therapists really like, is not greasy feeling, absorbs well and washes out of sheets easily. Plus it is very gentle to the skin.